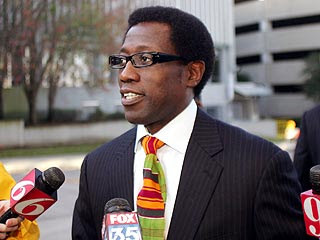 Wesley Snipes is about to pull an accelerated Lindsay Lohan and Paris Hilton prison sentence, it’s been announced. Snipes was found guilty of doing “tax tricks” with the US government and was therefore sentenced to 3-years in the clank. Yowza! Who knew filing your taxes was a requirement. I better get on that STAT. Yeah, well the court didn’t show too much mercy. Looks like Wesley is going to be slow dancing with a couple of inmates shortly. He didn’t, however, have to report directly to jail, but will be allowed to do so at a later date. How ’bout 2095? I’ll never understand why celebrities do this risky crap? You are rich, very rich. I would never break any law and risk ever not being able to spend my millions. Remember That Teacher Who Went to Prison For Banging Her Underage Student? Yeah, Well, Uh...Has That Law Changed?